The iPhone 5 was the most anticipated Apple handset launch since the iPhone 4. The 4S offered only an incremental, albeit antenna-fixing, upgrade, and the fifth-gen iPhone arrives just as many 4 users' 24-month contract comes up for renewal. However, in that time we've seen a seismic shift, with competing smartphones offering quality and desirability to match and even surpass the iPhone. With the big boys tempting users away from iOS with the lure of a slick Android experience as found on the HTC One X and the Sony Xperia T or much-improved Windows Phone interface – step forward the Nokia Lumia 920 - it's crunch time (sorry) for Cook and co. But wait a goddamn minute. Statistics don't lie (usually) and, just as we were putting pen to paper, Apple announced that pre-orders for the iPhone 5 hit two million in 24 hours, spanking its previous record of one million in a day for the iPhone 4 and ensuring that many won't see their new precious until October. So, with it clearly hooking the gagging mouths of many, how does it perform as 'the latest iPhone' and, crucially, how does it match up against the superphone stars of today? Let's start with the chassis because, let's face it, that's the only distinct visible change to differentiate it from its two previous family members. Grasp the frame in your hand and the first thing you'll notice is the weight; it's the lightest iPhone ever. By a long way. At 112g, it's 20% daintier than the iPhone 4S, 16% less butch than the Samsung Galaxy S3 and 14% lighter than the HTC One X. Reducing the SIM to weency, or 'nano', size has helped, minutely, as has making the shell out of anodised aluminium. The brace of glass strips adorning the top and bottom of the rear give both the black/slate and white/silver models a premium feel but are actually employed to allow an uninterrupted phone signal. No-one wants another antennagate. Despite Keynote claims, the 7.6mm-deep iPhone 5 isn't the thinnest smartphone in the world – the Huawei Ascend P1 S, Oppo Finder and ZTE Athena are all sub 7mm – but when the depth is combined with the weight, it feels sufficiently waif-like in the hand. And we're not convinced that's for the good. Of course we want our mobile tech to be light and lithe, but what we've loved about previous iGenerations is the weighty, industrial feel, the security of feeling something solid in your pocket (no jokes) and knowing that, if it takes a knock, it's not going to shatter into a billion plastic pieces. Don't get us wrong, it's a miracle how Apple has shed so much excess podge and millions of people will love the lightweight design, but we preferred the more robust, weapon-like nature of the 4S. A case of Marmite-y opinion, perhaps. The four-inch screen, which we'll come onto in detail shortly, is Apple's belated nod to the industry trend for bigger displays, and means the iPhone 5 now stands a proud 123.8mm tall – width remains the same at 58.6mm. The extra screen real-estate is welcome, though smaller-handed iPhone users might struggle to reach the standby button with a forefinger while holding it in a natural position. They might even have to stretch for the extra top row of apps. Just hold it a different way, perhaps. Because various components have been reduced in size, the headphone socket has been moved to the bottom of the device, which comes with its pros and cons. On the plus side, your phone usually goes in your pocket nose first, which means the headphone cable has a clear run out to your ears. On the downside, the jutting jack interferes with your hand when holding it 'upright'. Not all apps will use the gyroscope to flip the screen 180-degrees, either, so you'll have to get used to that. The bottom-hugging stereo speakers have also been given a boost, the better to annoy old people on the bus as you rattle out Skream's latest. Do your own iPhone 4S to iPhone 5 sound comparison and you'll realise the sound is unquestionably fuller and deeper. Then there's the Lightening connector. In our testing, we didn't find it any quicker for transferring content over a cable but we do prefer the new connector in terms of it being a) smaller and b) reversible. At the time of writing, the Lightening-to-30-pin adapter wasn't available – it sure ain't in the box, and it'll cost £25 on release – so we haven't experienced how it will cope with existing docks and accessories but it's safe to say, things could look ugly. There are add-ons that simply won't work with it, either – TomTom's iPhone car kit, for example. It's made us realise how many USB-to-30-pin cables we've amassed over the years and how, now, they're all redundant, apart from servicing the new iPad and nostalgic clear outs. So, onto the screen; it's still lovely and Retina; it now boasts 326ppi and a resolution of 1136x640; it's equally as bright and slightly richer in colour. There's space for a whole extra row of apps – woop! – and tasks can still be performed with one hand. The main benefit is that you can just see more. Web pages are longer, movies are wider, though many we found from iTunes and YouTube still have to be stretched or cropped to fill the screen, the photo viewing area is bigger (just) and Apple's own, optimised apps make good use of the extra space. Non-optimised apps are letterboxed, which doesn't feel right. Hopefully we'll see a raft of updates soon. Both iTunes and the App Store have also had visual upgrades and look clean when you're browsing, searching and splurging micropayments. If you're a long-time iPhone owner, you might find the elongation strange at first but you'll soon wonder how you coped before, as going back to a 4S feels like watching your old portable bedroom TV. However, if you've had an extensive play with the Samsung S3, HTC One X or Nokia Lumia 900, you still might find it too titchy – it's noticeably smaller, and that could be a sticking point for potential buyers. Everything feels slightly slicker when navigating the phone. Apps appear to load quicker, video feels a touch smoother, video and image processing is definitely faster. With the improved A6 processor now powering the visuals, our finger points straight at it, but it's with new apps that we'll really see the power of the chip take hold. Real Racing 3 (or any other A6-optimised game) wasn't available when penning this review, so we'll have to wait for developers to do their thing before witnessing any major power increase. The rear iSight camera remains impressive, taking great pictures in bright conditions. There's a bigger virtual camera capture button and video stabilisation seems to have improved. It now detects faces and auto-focuses in video and allows you to capture stills while taking video. The video-compression algorithm has also improved, reducing the file-size of footage without any discernible reduction in quality, and making for friendlier email attachments. Low-light image capture improvement was also discussed in the Keynote but we still experienced a fair bit of grain in our testing. The major improvement is with the front camera, which has been upgraded to 720p video, making FaceTime and Skype chats much clearer. Still shots are captured at 1.2MP, so not exactly archive-worthy. The new Panorama mode is intuitive and produces great results. It doesn't capture in landscape orientation, which feels counter-intuitive, but the speed at which it processes and pops out a pretty, panoramic shot is impressive. Though, even with the wider screen, you still have to zoom right in to see what you've captured. And while competing phones have had this feature for a while, if anything's going to be the new Instagram over the coming months, this is it. The iPhone 5 comes with iOS 6 as standard. But, at this point it's difficult to see where the unique differences are between it running on an iPhone 4S and iPhone 5. You can read our in-depth iOS 6 review but everything we've seen works on both. Flyover, turn-by-turn navigation, Passbook, PhotoStream sharing, FaceTime over cellular, VIP Mailboxes, Facebook integration, Do Not Disturb, improved Siri, pre-determined text replies to phone calls, the list goes on. Apple Maps will divide opinion. Even with some nice features the search functionality seems hit and miss in terms of finding London locations. It displays more road names than place names and colour-coded roads have gone, so navigating to a specific point via pinch and zoom is trickier. Then again, the 3D mapping, map rotation and Flyover features are all great. Maybe we'll get used to it but, as it stands, we prefer the old Google Maps. The extra screen length does give turn-by-turn Maps navigation – in portrait only – an advantage over the iPhone 4S. Obviously, you can fit more map on screen, with the direction tab sitting at the top, leaving a decent amount of space for the road you're on and your surroundings. Walking and bicycle routes can also be plotted. Voice directions are basic but clear, though it doesn't seem to utilise its traffic feature to route you around black spots to your destination. It's not bad for a free service. Passbook is interesting. Retailers and businesses will need to sign up – for free, apparently – but once on board, you'll be able to download flights, tickets, vouchers etc from them and store them in a digital wallet. It's a neat idea, and could mean users don't miss NFC, but as no UK outlets have signed up yet, we couldn't test it, though we did enjoy the slick email-to-Passbook path. The iPhone is one of several top-tier devices, including the Samsung Galaxy S3, that's available on EE's 4G data plan. According to EE, its 4G LTE network offers speeds that are five times faster than those on 3G. Using the Speed Test iOS app, we found that the iPhone averaged an impressive download speed of 19Mbps on 4G (compared to just 3.5Mbps on 3G), while average upload speed was clocked at 22Mbps (with 3G at a lowly 1.3Mbps). The EE 4G network currently covers 11 UK cities - with the total set to grow to 16 by the end of the year. Prices start at £36 per month (with 500MB of data), with the highest tariff being a whopping £56 for 8GB of data. But is it worth it? We tested out the phone's 4G capabilities around London Town, with the majority of our time spent in Central London including time clocked up in the East End and south of the river. We found the signal to be strong for the majority of the time, but it did have the tendencey to drop out, far more than 3G ever does in the city. We were slightly concerned by the considerable amount of data usage that we clocked up during the time that we had the phone (albeit with frequent, review-related testing), the amount of which would have gone over the limit on the most affordable data packages. As we expected, when the 4G is working, it's superb. Combined with the speed of the iPhone's new processor, downloads are practically instant, and streamed video is smooth and clear. However, it's a different story if the signal drops out and you're relegated to 3G. For everyone except super-early adoptors, the high tariffs simply won't be worth the jump quite yet. However, as prices come down and coverage improves, 4G will begin making its way towards becoming the standard. In our testing, real-world battery life doesn't seem to have changed much since the iPhone 4S, which could be seen as a good thing considering the iPhone 5 is a more advanced product, but you'll still need to charge it every night to give you enough juice for the next day. You can watch a couple of films on a flight or listen to hours and hours of music on one charge, but talking and 3G surfing take a heavier toll, and 4G connectivity could be even more of a drain. One very welcome improvement are the new EarPods, which come as standard. While we think you can get better cans for the £25 they cost as a separate purchase – check out our Apple EarPods review – it's great to have a better audio experience straight out of the box. Prices for the 16GB, 32GB and 64GB models are what we've come to expect from new smartphones; expensive. The iPhone remains pricier than its competitors, both as a standalone handset – you can get a 16GB Samsung Galaxy S3 for around £100 less than the equivalent iPhone on Amazon – and on contract. So, what to make of this latest upgrade. There's no denying that the iPhone 5 is a lovely thing, and the best iPhone to date. It could well be Apple's best-selling unit ever. Apple's competitors never been closer in terms of quality, function and aesthetics and from your feedback on our social networks we know how many of you are jumping ship to phones with a bigger screen and more features. 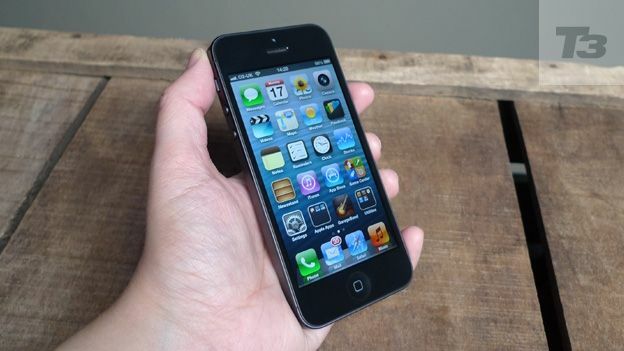 Given that iPhone 4S users can upgrade to iOS 6 and do just about everything the iPhone 5 can do, and that Android users can get similarly impressive handsets for less dosh, we reckon the smart money won't all be going on a new iPhone this year, even if the mass market can't get enough of it. It's good, very good. But it's no longer the best around. What can we learn from the cryptic invites of the past?